The YouTube smartBar+ application for Windows PC's, Laptops, Tablets or Windows Phones is a set of powerful metro-style toolbars that work together with YouTube. They are located on the top of the page and they act like Internet Explorer’s add-ons. ! For each video you select, smartBar+ automatically analyzes the video and provides you with some useful, cool and powerful options (see the app. features for details). 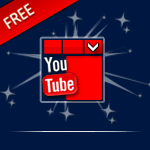 This way, you are free to have the whole YouTube features while browsing (e.g. access your YouTube account with two-step verification, organize your playlists, search for videos, get recommended videos, post comments on others vids, etc. Generally speaking, everything you can traditionally do. With the use of smartBar+ the browsing becomes more exciting. (for example: start a background download of the video in a specific quality), and continue to other videos immediately. 2. Video download  -  for each video, smartBar+ provides you with a list of the available Video Quality encodings for it (e.g. SD: 360P, 480P or HD 720P, 1080P, etc.). 3. Create FilmStrip  -  NEW! : automatic extraction of multiple frames from the video (PhotoStory). After a few seconds, without having to download in your PC, the PhotoStory is ready! 4. Play with extras  -  NEW! : use of app's internal player (more features from the YouTube one): Rotate the video (6 modes), Adjust brightness, contrast or saturation, Take snapshots, etc. 5. PlayTo  -  send the video for playback to other devices (DLNA compatible) without downloading to PC. Free to switch to other apps - playback continues! The PlayTo option is not yet availiable for the Windows Phone version of the app. (Windows Desktop apps, Windows Store apps, Windows Phone apps, iPhone, iPad, Android) so we are very proud!